Politicians are “public” servants, they vote on things that affect all of us and therefore any information about them is up for review and scrutiny, including their sexuality. I’m pretty sure he outed himself when he left the house in that horrendous outfit. It’s called Public Service. If you don’t believe in who and what you represent, get out and let someone else do the job. He has to live with himself and his decisions. Hypocrisy is the worst of all sins. 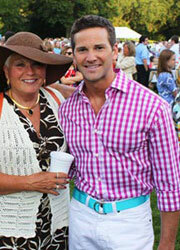 Nice teal belt and pink shirt … I have ones just like them …. I think it’s very telling of what is wrong with our society that anyone thinks it’s hypocritical for a politician to put his own needs aside and vote based on the needs and views of the people who voted for him and therefore should be represented by him. That’s no hypocrisy, that is actually how it should be. His personal feelings or desires should NOT be what drive his vote. His CONSTITUENTS’ needs should be. He ran and was elected as a Repiblican and he votes as he promised he would when he was elected. Unfortunately most politicians forget that this is how it’s supposed to be, turning into spoiled 4 year old girls stomping around saying? “But I waaaaant it that way” instead of listening to the people who put them in office. What a refreshing story this is — a politician who understands his job! The problem is not with him putting the desires of his constituents ahead of his own – the problem is with him pretending to be something he’s not. If he were actually honest about who he was and was still voting against LGBT equality and claiming it was because it’s what his constituency wants, then that’s courageous. What he’s doing now is cowardly…and not becoming of a US Congressman. The other issue comes in when the LGBT community is somehow expected to keep his secret for him while he votes to strip us of our rights. It’s not fair that we should have to shield someone who is actively trying to hurt us simply because he’s gay. Politicians are public “servants”, they vote on things that affect all of us, and therefore any issue they vote on should be in accordance with their constituency’s views not necessarily what is in their personal best interest. Their personal lives are up for as much scrutiny as anyone cares to pay attention, but the job they were elected to do should reflect the interests of their voters; if that happens their shouldn’t be anything of note occurring when a man or woman votes against self interest.